Apple introduced Business Chat at WWDC in 2017 and launched it with iOS 11.3 this past March. 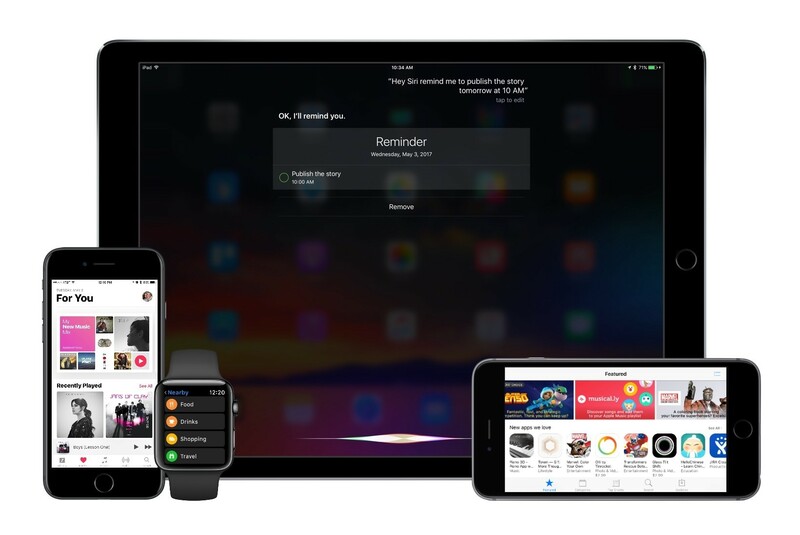 Today, Apple confirmed to TechRadar that the feature, which began as a beta with a handful of US business partners, has been rolled out worldwide. Business Chat is a way for businesses to communicate with their customers directly over iMessage. Apple's goal with Business Chat is to elevate the customer service experience to take advantage of the best native features of iOS, such as iMessage's inherent privacy and security, iMessage apps, Apple Pay, and integration with Maps, Safari, and Spotlight. Much like Apple Pay, Business Chat is the sort of feature that isn’t likely to see significant user adoption until a large enough pool of businesses use it to reach most iPhone owners. Still, today’s broad rollout in multiple countries shows that the service is beginning to get traction. It will also be interesting to see how much longer Business Chat retains the ‘beta’ label. I live in Italy, but because of my work I communicate with friends and colleagues in English. All my devices are set to English, including Siri on our HomePods. As a multilingual iOS user, the addition of multilingual typing to the QuickType keyboard was, by far, one of my favorite changes in iOS 10. Besides being aware of the language used in each iMessage conversation, since 2016 the QuickType keyboard has been able to jump between multiple languages on the fly without switching keyboard layouts – which is amazing when you have conversations with people who live in different countries. I can't believe there was a time when I was constantly switching between the Italian and English keyboards hundreds of times each day. For international users, it was as bad as not having copy and paste before iPhone OS 3.0. With the release of Shortcuts and the ability to send iMessages in the background (without showing the Messages composer), I had an idea: what if instead of typing I could use dictation (also improved in Shortcuts) to quickly send a message from a widget? A shortcut to accomplish this seemed relatively easy to build, so I got to work. However, after a few minutes of tests, I realized that Shortcuts' dictation didn't support automatic language recognition – which meant I had to consider a more creative approach. Today Apple released iOS 11.4, likely the final major release for the operating system before its successor, iOS 12, reaches the public in September. The update includes two major features that were originally revealed last June as iOS 11 features, but were later delayed: AirPlay 2 and Messages in iCloud. With the release of iOS 11.3 beta 1 and corresponding developer release notes, Apple announced that iOS 11.3 includes the Messages in iCloud feature. Messages will prompt users to turn on Messages in iCloud on first launch after upgrading to beta 1. Users with two-factor authentication and iCloud Backups enabled will get Messages in iCloud enabled automatically. It's not certain that Messages in iCloud will make its way into the public release of iOS 11.3, but its presence in the first beta is a positive sign at least. 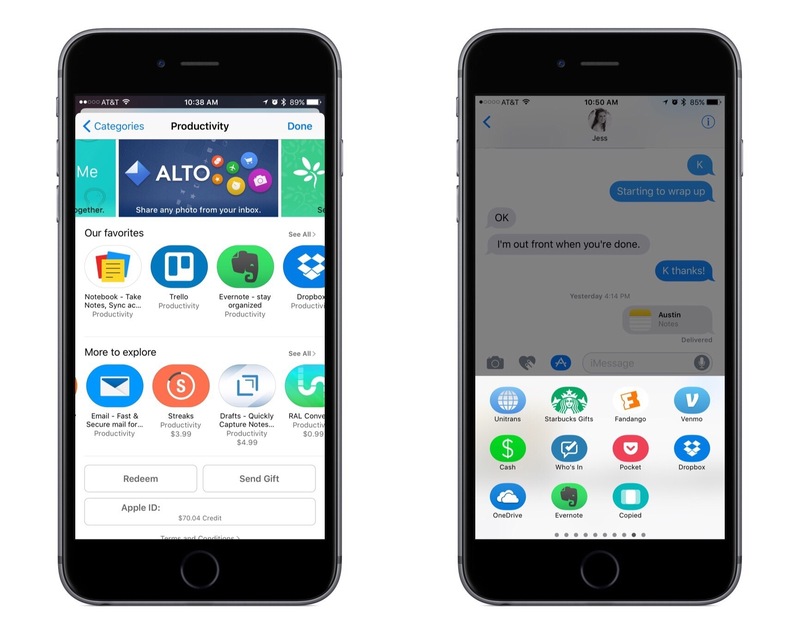 First announced at WWDC last June as an iOS 11 feature, Messages in iCloud is just what it sounds like: all your Messages across all your devices are stored in iCloud and kept in sync. The feature was present throughout the iOS 11 beta cycle last summer, but was removed before iOS 11's public release. I never had any issues with it during the beta season, but clearly some users did, causing Apple to delay the feature until its reappearance now. Today YouTube’s iOS app received an update that includes the video service’s first iMessage app. The app only focuses on a single function – sharing videos – but it does well with that one thing, offering a robust sharing experience. Upon opening the YouTube iMessage app, you’ll see a list of videos you’ve recently watched. This appears to pull videos directly from your full YouTube history, presenting a seemingly endless scrolling list of everything you’ve watched. Often iMessage apps contain a mere fraction of the information found in their parent apps, so I was expecting to only see a small number of recently watched videos listed; the ability to continue scrolling through my full history is a pleasant surprise. Another welcome addition is the inclusion of a search option. 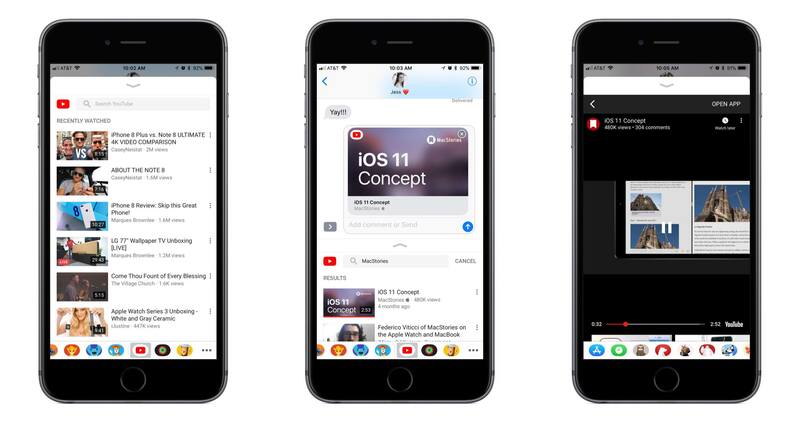 At the top of the iMessage app, you can search for any video on YouTube – either by text or by voice. Tapping the search box even reveals a list of your recent YouTube search queries. 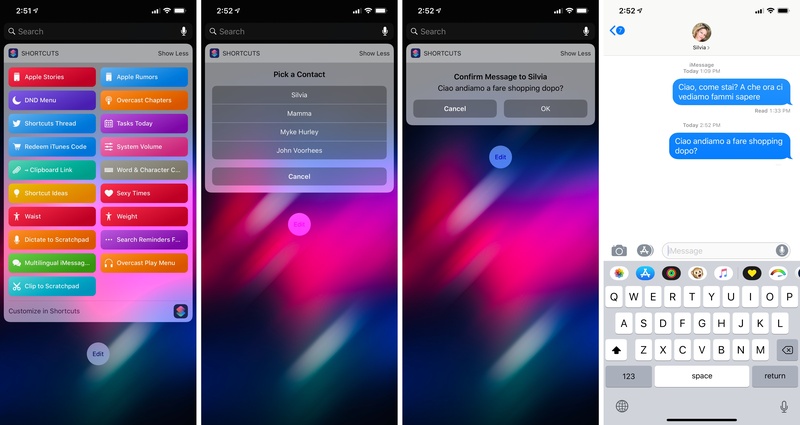 When searching for the right video to share, YouTube’s iMessage app lets you view any video in full before sharing – just hit the vertically stacked dots on a video’s right hand side to find a Watch button. Once you’ve chosen a video to share, it will populate as an iMessage card that can be sent to friends, and they’ll be able to watch the video without ever leaving the iMessage conversation. YouTube is a solid demonstration of a rich iMessage experience. Even though its purpose is limited to sharing videos, it offers access to everything you might want before sharing – your full watch history, a search option with recent search queries listed, and even the ability to watch a video inside iMessage before you send it. iMessage app developers take note: just because your app serves a single purpose doesn’t mean it has to be a bare-bones experience. It has been nearly a full year since Craig Federighi introduced the iMessage App Store to developers at WWDC. Coming out of that keynote, it was easy to guess that sticker packs might become a hit with users, but the big unknown surrounded the idea of more powerful iMessage apps. Would anyone actually want to use iMessage for anything more than basic messaging? The challenge with creating a great iMessage app is similar in ways to that of creating a great Apple Watch app. In most cases it requires taking an existing app and stripping functionality down to its simplest form, while still retaining the overall usefulness and power of the full app. And as is true with Watch apps, some iMessage apps tackle the challenge well, while others fail to be useful due to slow or overcomplicated interfaces. The first year of the iMessage App Store has been dominated by stickers, but amidst the crazy sharks and flaming pizza, there are a number of interesting and creative apps serving as helpful utilities as well. I have tried out iMessage apps for ordering food, managing files, sharing calendars, sending payments, planning meetings, and more. What follows is a list of some of my favorites. Apple is known for its quality hardware and software, but services are another story. Cloud-based services are the future – there's no denying that. And Apple historically has struggled with its cloud offerings. From MobileMe, to the early growing pains of iCloud, to the Apple Maps fiasco, the company gained a poor reputation in the area of services. There's a lot that feels outdated here, including the fact that both Mac and iPod are highlighted before the iPhone. But one major way this paragraph fails to describe the Apple of today is that the word 'services' is nowhere to be found. Services are a key component of modern Apple. The way the company defines itself, along with the numerous services shoutouts in quarterly earnings calls, prove that. Despite Apple's increased focus on services, the common narrative that the company "can't do services" still hangs around – in online tech circles at least. But is that narrative still true, or has it grown outdated? My aim is not to perform an in-depth comparison of Apple's cloud offerings and competing products. Though competitors and their features will come up occasionally, the focus here is on my experiences in everyday living – my experiences, not yours. I understand that just because something does or doesn't work for me, the same isn't necessarily true for you. The point of this piece is not to try proving anything; instead, I simply want to assess and share my current experiences with Apple's services. 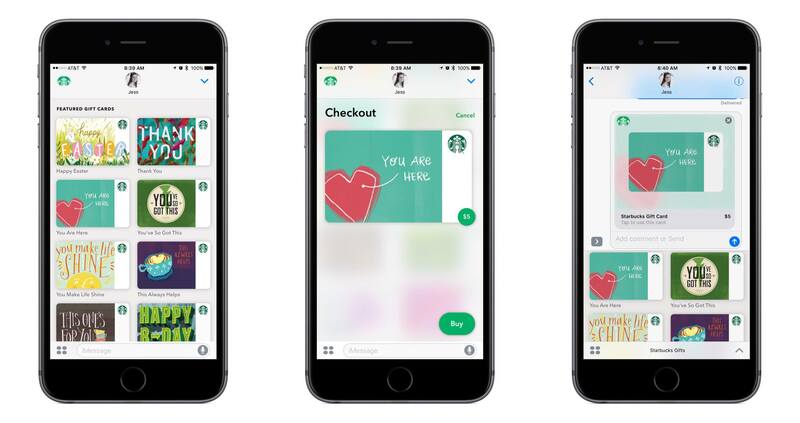 Now you can send Starbucks Gifts with iMessage with Apple Pay. Be one of the first to send a $5 or more Starbucks Gift via iMessage and receive a $5 Starbucks Gift for yourself - while supplies last. The promotion ends on April 23rd, or after 45,000 people have taken advantage of it – whichever comes first. The process of sending a gift card through iMessage is extremely simple. Assuming you already have Apple Pay setup on your device, you just select the style of gift card – options include things like 'Congrats,' 'Thanks So Much,' and 'Happy Birthday' – select a quantity of $5, $10, or $25, then hit 'Buy' and authorize Apple Pay. The whole process takes mere seconds. While the idea of sending gifts through iMessage had never occurred to me before, Starbucks has convinced me that it can be a great experience.